“you have to try it"
It can be said that this is a Northern recipe because both the burritos as the grilled steak are typical recipes from Northern Mexico . 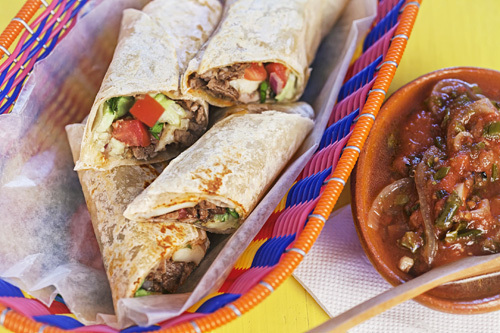 Although many people don’t know the grilled steak burrito, the reality is that it is a very similar burrito to the others because is also prepared with beans. – and that’s not all because it also has as filling cheese, tomato, onion, lettuce and avocado. All these ingredients are wrapped in a tortilla and they make the burrito big and full of flavor. *Many people think that the burritos are very popular in Mexico... the truth is that it is very difficult to find a place where a “good burrito" can be enjoyed. The good thing is that with this recipe you can prepare some delicious burritos, that your relatives and friend will love. The burritos are so big that are always served as main course and they can be accompanied with red rice or mixed salad and a corn guacamole. To prepare the burritos there are many steps to follow but they are easy to do. Just pay lots of attention at the moment of rolling them since they have their trick. The flour tortillas that are used in the burritos must be extra large, of approximately 10 - 12’’ in diameter. In this recipe a cheese that melts will be needed, we recommend the asadero cheese as it is perfect for the burritos. The total preparation time is of 20 minutes . Clean 14.1 oz of beef fillets. Dice all the beef fillets that were cleaned. Sprinkle over the beef dices that were cut pepper to taste and 1/2 tablespoon of salt; then set aside. Incorporate in the frying pan the beef dices with the ones you worked and fry them for about 4 minutes, until they are well cooked; stir regularly. Then set aside. Heat in the microwave 1 cup of refried beans for approximately 1½ minutes, until they are well heated; then reserve. Some of the Grilled Steak dices that were cooked. Some of the Onion dices that were cut. Some strips of the Avocados that were chopped. Some of the Lettuce strips that were chopped. The cheese is placed in-between the warm beans and the warm beef so the heat of these 2 ingredients will melt the cheese. Fold the tortilla ends inwards and then roll the grilled steak burrito as taco; then serve it. Repeat the same procedure with other 5 extra-large flour tortillas. Tip: Your favorite salsa can also be put to these burritos. Variation: Would you like to prepare ground beef burritos ? Did you like the Steak Burrito? ☞ While you eat the Burrito you will need a Mexican Drink. ☞ You have to close this delicious meal with a Mexican Dessert. ☞ What do you want tomorrow for Breakfast ? ☞ See the Mexican Cookbooks.